When a dishwasher seems to be leaking from the left side of the unit, there are quite a few potential causes. Sometimes fixing the problem is as simple as loading the dishwasher correctly, but there may also be an issue with one of the dishwasher components that will require greater attention to resolve the leak. To avoid injury, always disconnect your dishwasher from a power source before doing any troubleshooting. Load large dishes along the sides and rear of the lower basket to avoid water deflection and leaks. How the dishwasher is loaded can make a difference when it comes to leaks. If there are large items in the front of the lower rack, water may bounce off the dishes and leak out the left side of the door. If there are no dishes in the lower rack, water can hit the door and leak as well. While you are loading the dishes into the rack, check the door and look at the door gasket. Wipe the gasket with a clean, damp cloth if there is dirt or debris on the gasket and look for any signs of damage that may allow water to leak through. Contact the dishwasher manufacturer for service if the gasket should be replaced. Another reason the dishwasher may be leaking from the left side is if the dishwasher is not installed evenly. If possible, move the dishwasher out from under the cabinets and place a level on the top of the dishwasher. Use a wrench to adjust the leveling legs until the level shows that the dishwasher is even. Carefully slide the dishwasher back into position. If the dishwasher cannot be moved or accessed, contact the dishwasher installer or a service technician to assist you with this step. While the water inlet valve usually doesn't leak, the water lines running to and from it might. 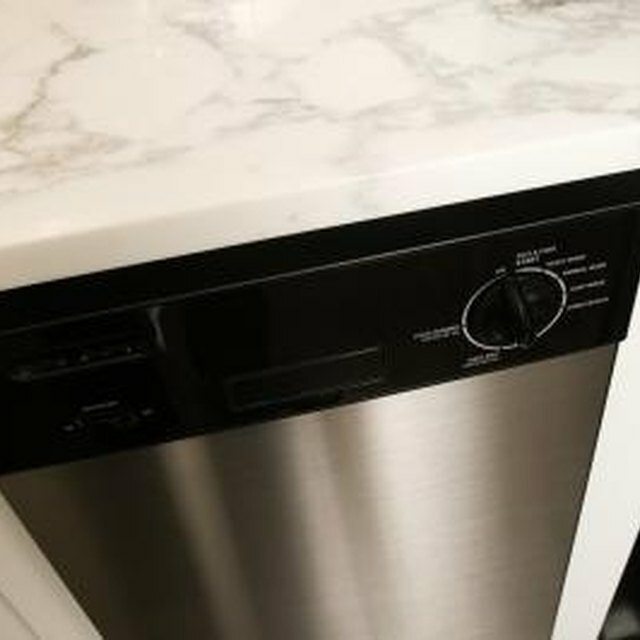 To check, remove the lower access panel on the dishwasher and find the water supply line and the water inlet valve, as well as the rubber tube that extends from the valve into the dishwasher. Tighten the connections and inspect the water inlet valve. If the valve is stuck open, the water will leak out of the left side of the dishwasher. Contact a service technician to have the water inlet valve replaced. Likewise, if the water supply line or tubing is cracked or damaged, these parts will need to be replaced as well. There are several water hoses that connect the water supply as well as the drain located behind the access panel. Check each of the hose connections and apply a new clamp if the connection is leaking. The hose may need to be replaced if the hose itself is leaking or damaged. Contact the dishwasher manufacturer or another service technician for assistance.